Failed to install module : One or more of the Perl modules needs Module::Build to be built, but this Perl module is not installed. As described in the error message, the system is unable to compile and build Perl modules as Module::Build module is not installed. The error commonly happens in system which is not installed as a development machine. To resolve the error, just install the Module::Build module. The tutorial will install the Module::Build Perl module and its necessary dependencies via Webmin. 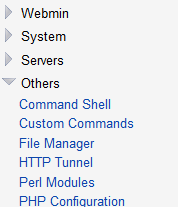 Login as root, or a webmin user with full access. Enter Module::Build in the text box after From CPAN, named, and ensure that its check box is selected. Click on Install button to install the module. Click on Return to modules list when done.